An ISO-New England operator stands in their control room in this file photo. New England’s electric grid operators are preparing for the region’s next nor’easter – whenever it arrives – with a special storm training completed earlier this month. The control room operators at the nonprofit grid manager, ISO-New England, coordinate electric supply with demand, across all six states, around the clock. “Visualizing it like a NASA control room … if you have that picture in your head, you’re on the right track,” says Stephen George, ISO’s general manager of operational performance and training. His team’s latest simulation was designed by federal scientists. It was a six-hour slice of a hypothetical two-day nor'easter, modeled on the historic New England blizzard of Febuary 1978. 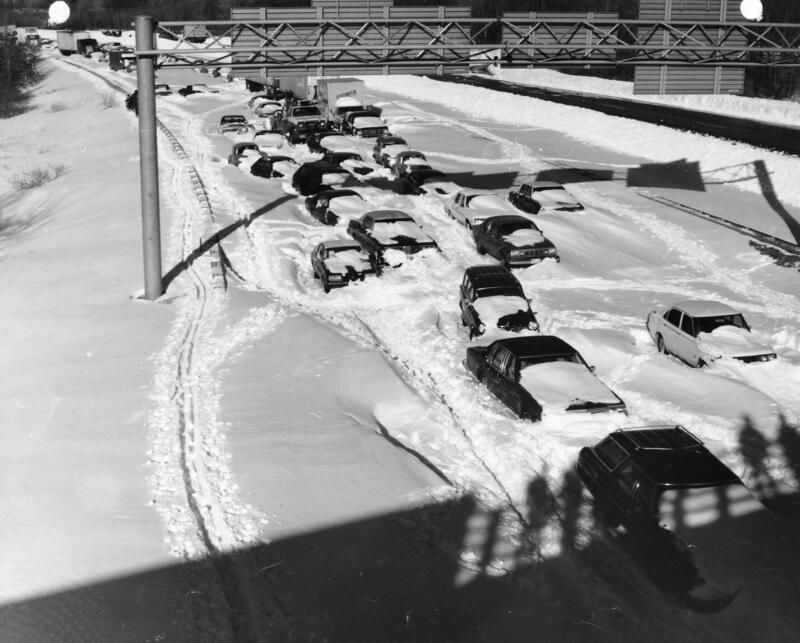 Cars are buried in snow on Route 128 in Massachusetts during the nor'easter of 1978, which was the model for the ISO simulation. He says this allowed operators in their Connecticut backup and training facility to practice reacting, communicating and planning ahead to keep the grid stable through the hypothetical severe storm. “We wanted them to experience the impacts of things like storm surge and substation flooding – obviously transmission line outages, generator outages,” he says. George says the simulation showed how infrastructure in coastal areas would be affected, and incorporated coordination with neighboring grids in Canada and the Mid-Atlantic. The design estimated that a storm like 1978's could knock out power to about 2 million New Englanders today. In that scenario, the ISO operators’ job would be to reroute power away from blacked-out areas, but make sure it was still available for use when local utilities repaired damaged infrastructure and the lights came back on. There are only scattered outages, as of 5:30 p.m. Eversource had halved its customer outage to just 50. 3 p.m.: The latest nor'easter is going a lot easier on area utilities than last week's storm. So far.